William Wilders was born in Quorn in 1838 and died in 1893. We are lucky to have this picture of him, as photography was still in its early days for the ordinary working person. “William Wilders stands beside his pony and trap. His career gives us an insight into the uncertain world of the later nineteenth century. Mr Wilders began work in a local quarry . His health was undermined by the arduous nature of the job and he had to find a way of making a living in some other way. In those days there were no insurances or pensions available for ordinary people who lost their livelihood. Quorn was quietly prospering and William Wilders saw an opportunity by opening a greengrocery business. Specialisation of this kind did not take place outside of the very large urban centres until the early 1880s. 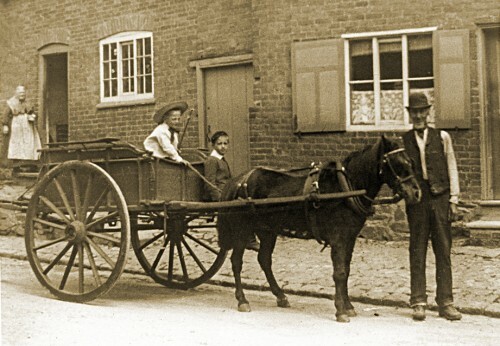 By this time more people had money to spend on a more varied diet and even in a village like Quorn there were many families who lived in cottages with very small gardens and nobody available to look after an allotment. Greengrocers bought produce from local suppliers with a surplus of fruit and vegetables and augmented their stocks by going to the markets at Loughborough or Leicester. In these larger towns once rare and exotic fruits like lemons and oranges were becoming plentiful and cheap. Probably the most spectacular fruit to enter the popular market was the banana in the 1890s which moved from being an expensive treat to a regular part of the fruit display within the decade. Doubtless the rapid spread of beliefs that bananas had hidden aphrodisiac powers boosted sales. Undoubtedly Fyffes became a household name in this era.